The Pannonian Basin is situated in the middle of the European mountain ranges – the Carpathian arc, Dinarides and Eastern Alps. Surrounding mountains show their beautiful face but only geologists know how complicated the structures of the rocks are at the basement below this peaceful land. Our study area represents the two northernmost parts of the Pannonian Basin system, divided by the central mountain mass of the Western Carpathians (fig.1. ): the western part is called the Danube Basin (Slovakia, Hungary and Austria) and the eastern part the Transcarpathian Basin (Slovakia, Hungary and Ukraine). These two have a very different geological evolution. Although the lowermost Miocene is also represented by marine sediments, the forming of the Danube Basin dates back as early as the lowermost Karpathian. All rock complexes of the Western Carpathians older than the lower Miocene are almost the same as in the Eastern Alps. 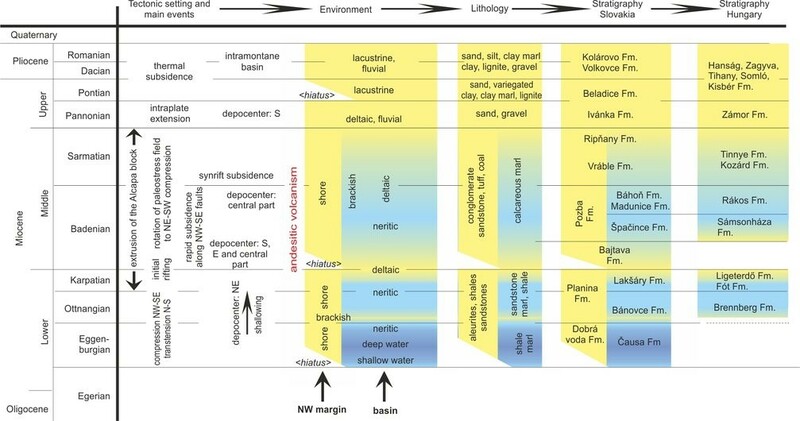 The large-scale process of the escape initiated many processes such as volcanic activity and importantly the region-wide extension involving strike-slip and normal fault systems of dominantly NE-SW and NW-SE directions (fig.2.). The tilted and subsided basement blocks of the Danube Basin are today arranged ni four main NE-SW branches – deep troughs –and a huge central depression almost exactly below the Hungarian – Slovakian border. Although we have the highest point of the Western Carpathians’ basement rocks 2654 m above sea level, the lowest point is at least 8 km below the recent surface. The timing of these movements and the related sedimentary evolution (i.e. 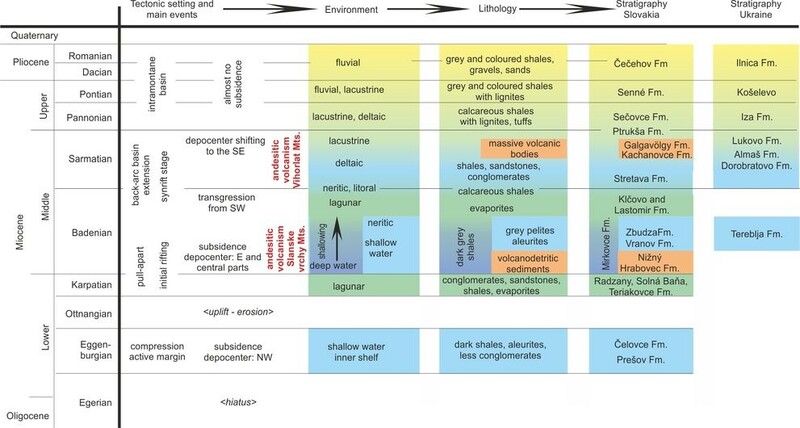 the sedimentary changes that have recorded successions of deepening and shallowing) is also a very complicated story as the sub-basins opened and deepened. Although the NW edge of the basin (SE slopes of the Malé Karpaty Mts.) shows evidence for shallow water or brackish conditions (or even hiatus), while the central part was deepening during the Badenian and then shallowing and changing its character to brackish and finally, after the Sarmatian, to lacustrine or fluvial (fig.3.). Volcanic activity of dominantly Badenian, and to a lesser extent Sarmatian age is known mainly from the Central Slovakian paleovolcanoes (Kremnica, Štiavnica, Poľana etc.) as well as from boreholes. The Transcarpathian Basin is localized on the opposite side of the Western Carpathians and its development started later in a different stress field. We interpret the basin as a back-arc basin between the older Slanské vrchy Mts. volcanic arc and the younger Vihorlat – Gutin Mts. Arc, extending through Ukraine as far as Romania. The structure of the basin is formed by a set of SW dipping normal faults on the NE side and NE dipping faults on the SW side – so the structure is simpler than in the Danube Basin (fig.4.). But while the basement of the Danube Basin is relatively well known, it is far more problematic in the Transcarpathian Basin. While the western part of the basin is developed on Western Carpathian (mainly Gemeric, Veporic basement with Fatric nappes), well data has also demonstrated the presence of the problematic Inachovce-Krichevo Unit with Penninic affinities. 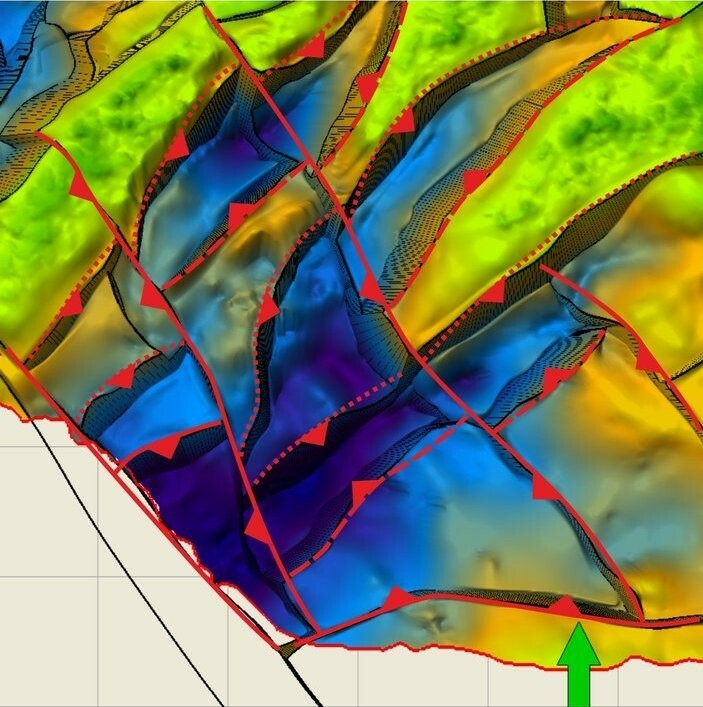 The formation of this basin starts in the Karpatian with initial rifting, rapid subsidence and synchronous andesitic volcanism of the Slanské vrchy Mts. culminating in the lower Badenian and followed by a shallowing phase. In the upper Badenian, a new subduction front was established on the east, generating the new, younger Vihorlat – Gutin volcanic arc, and a back-arc basin, thus most of the Sarmatian is developed in a deeper sea environment again. 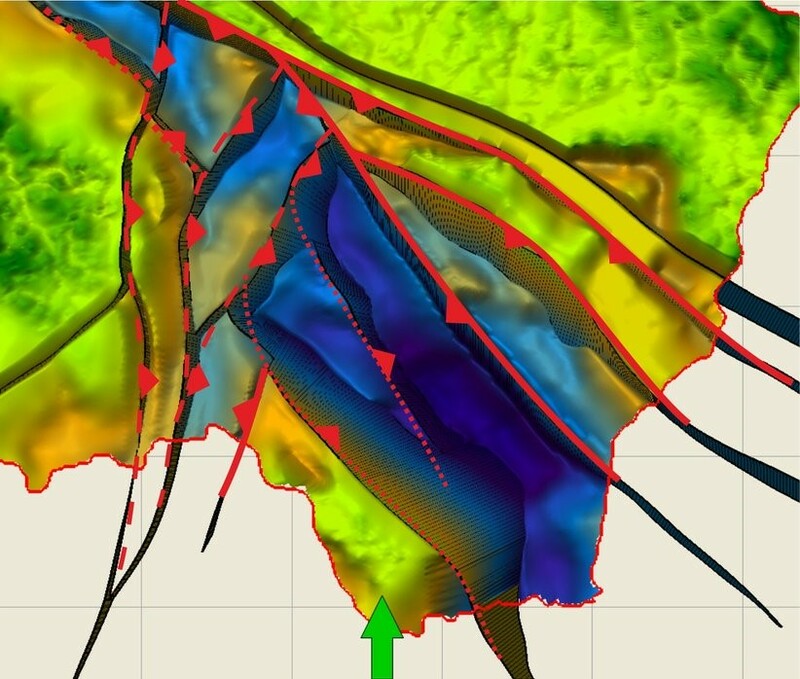 At the depocenter of the basin, main volcanic activity was gradually shifted further to the SE towards the Ukrainian and Romanian territory; in Slovakia already during the Pannonian, there is almost no subsidence resulting in fluvial and lacustrine filling of the basin (fig.5.). Kováč, M., 2000: Geodynamic, paleogeographic and structural evolution of the Carpathian-Pannonian region in Miocene – A new view on the Neogene basins of Slovakia (in Slovak). Veda, Bratislava, 204 pp.